As a charity offering our bereavement support service free of charge to our clients, we rely heavily on donations both large and small. Donations can be sent via BACS Transfer* or by cheque (payable to Bereavement Care). Donors can also give using the BT MyDonate service (click to open the BT MyDonate page or button at top right of page). *If you wish to make a payment vis BACS Transfer, please contact our office for details of our account. P. Bowskill was the winner of the ‘Toys Quiz’, devilishly compiled by Val Austen. Many thanks to Val for producing another excellent mind challenge! Thank you also to all who took part. £96 was raised – and hopefully a lot of fun achieved as participants struggled to unravel the cryptic, word-play or general knowledge clues. Here are the Answers. Please click on the link. On the evening of Saturday 17th January 2015, Bereavement Care held its (now annual) Fish and Chip Supper Quiz. The format was the same, the venue the Victoria Hall, Sheepcote Road, Harrow and the quiz master Selwyn Foreman and his team of helpers. Around 120 people attended the quiz – the tickets had been a sell out when they had gone on sale in November. 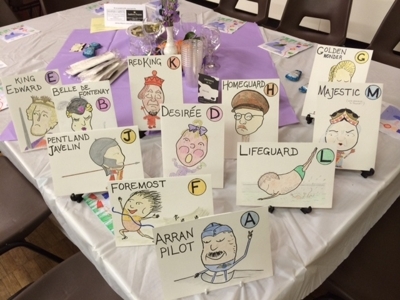 The photo shows the illustrated names of each of the twelve tables that were competing in the Quiz- all were named after different names of potato,ranging from Red King to King Edward. The fish and chips this year were supplied by Barracuda in Harrow and we thank Hoopers Carpets and Andrew Pearce Estate Agents for their sponsorship as well as all those who kindly supplied the raffle prizes. All gave generously to the raffle which raised £426. The nine rounds of questions ranged from Who, What and When and the Dingbats Marathon on the tables had everyone puzzling. Table J, the proudly named Pentland Javelin, came top in the end. It was, like last year, a great evening much enjoyed by all those who came. Our thanks to all for the support – the event will have raised around £2,000 for Bereavement Care and is a very welcome addition to our funds. Particular acknowledgement must be made to Bobbi Riesel and Jack Lynes who organise this yearly event and make it such a success for all concerned and to Val Austen who painted our little Potato friends and orchestrates the decorations. 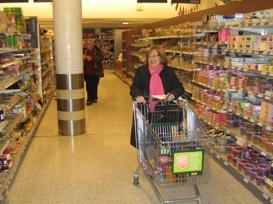 “Over October and November many £1 tickets were sold in aid of Bereavement Care and a final push was made in the last week of November when volunteers manned the stall in the foyer at Waitrose, Kings End, Ruislip to sell the raffle tickets to customers at the store. Over 3,000 tickets were sold in all thanks to all the helpers. The draw for the winning ticket was on November 30th and the winner was Mrs Sue Soloway of Ruislip. She arrived at 4pm on Sunday 7th December for the Dash itself. 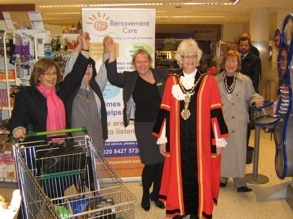 In attendance was the Mayor of Hillingdon, Councillor Catherine Dann and her Mayoress. Sue dashed round the store putting in smoked salmon, chocolates, biscuits, and all sorts of other good things for this festive season. Our very good thanks to Waitrose for allowing us the foyer for a week to sell the tickets and for clearing the store on the Sunday to enable the Dash to take place. This is a major fund raising event for us and one that brings a bit of seasonal cheer. In addition, it enables us to distribute any number of leaflets to people in Hillingdon, many of whom have been unaware of us. The winner, A. Smith, achieved a score of 39 and there were several in the 34 – 38 range, so well done. Thank you everyone who took part, your efforts raised £108. Also, many thanks to the 3 donors of the prize token, who ask not to be named. (I am told my middle name should be ‘Devious’!!) Val Austin.